By the Waters Edge: I’m sure May is in Summer? I’m glad I didn’t call this blog “Summer in the Callows”! I can’t believe it’s the middle of May, we’re wrapped up as if its winter when out doing fieldwork; dodging the hail showers and trying to warm our hands under our armpits. And the wind, there are actual waves on the river most days! I’ve never seen so little grass on the Callows, which says a lot given that I’m born and raised here. There's been so little growth that most of the wader sites look like the winter flood has just receded. The poor farmers are really starting to struggle, many have had to re-house livestock and resume winter feeding. If this weather keeps up they are going to be very short of feed which could make adhering to the grant scheme stocking restrictions very difficult. On Inishee Island the Redshank count is up to between 23 - 25 pairs, we also think there is an eighth pair of Lapwing; were hoping to confirm these numbers later in the week. Eight pairs of Redshank have already hatched chicks and we expect a few more the next time were out. The chicks will still be nothing more than tiny balls of fluff; it’s hard to believe they have to fend for themselves. The weather must be punishing on them, how they’ll manage the frosts that are promised I just don’t know. I can’t imagine that food is too easy to find at the moment either, for while there are lots of shallow muddy pools, they’re not exactly alive with flies and insects. Fingers crossed they manage to keep warm and find enough food. 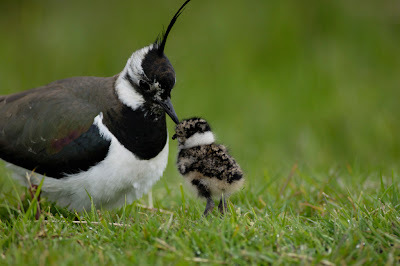 Lapwing don’t seem to be having a very good year on the Callows. It looks like quite a few pairs have taken a year out and not even tried to breed. Birds returned as normal and hung around for a while, but never started breeding and many of them had left by the end of April. It’s not unusual for them to miss a year when the weather is this bad. Sadly we already lost our first two broods; they only survived for about a week. We spotted a fox hunting in the area last week, so we’re not sure if they perished because of the weather or depredation. There was no sign of them when we surveyed the site last Friday and I came across the adults feeding in a flock just down river. They took off, flying high and away from the Callows. When they fail, they leave the Callows almost immediately. The Whimbrel have started to flock and are getting ready to move on. Whinchat have arrived back to some of their usual sites and Wheatear are now passing through. They must have gotten a shock, given the weather. I even turned up four Turnstone on Friday. They were so totally out of context that I spent the first few minutes trying to turn them into Ringed Plover!! I’ve never seen them on the Callows before and even more amazingly, the only other record of them in the Midlands, that I know of, is from Lough Boora in 2010 - on the same date! Fingers crossed the weather improves soon. Hopefully a bit of warm weather will arrive soon! love the new blog Kathryn! You paint a vivid picture of life on the callows.